Okay, you're probably thinking no way can I afford orchids for weddings, if you are, you might want to think again. 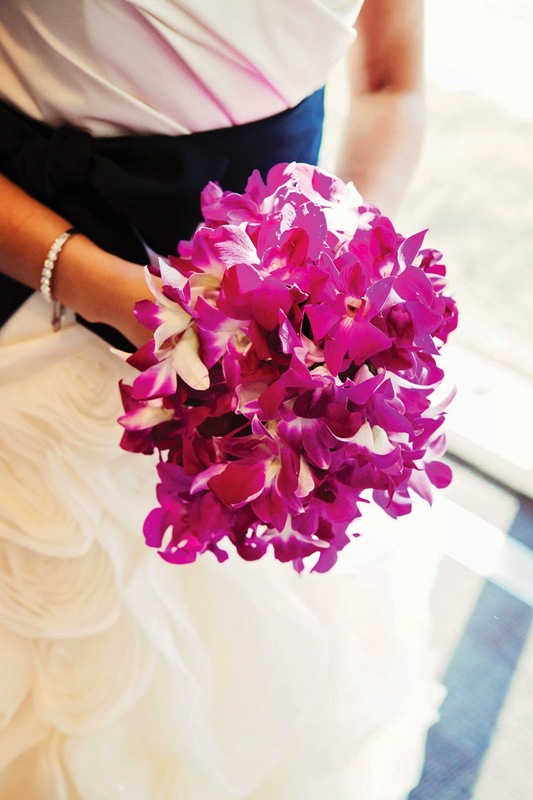 Orchids can be very expensive, especially in a wedding bouquet. However, if you buy them in bulk they're cheaper than roses. Let's say you have 10 tables that require centerpieces. You could buy the centerpieces at the florist for about $35 each. Or you could buy 20 stems of purple Dendrobium orchids for about $50. Five stems in a tall clear glass vase makes a beautiful centerpiece for only $14. That's $12 for the orchids and $2 for the vase you pick up at a thrift store. That's a savings of $21 per table. 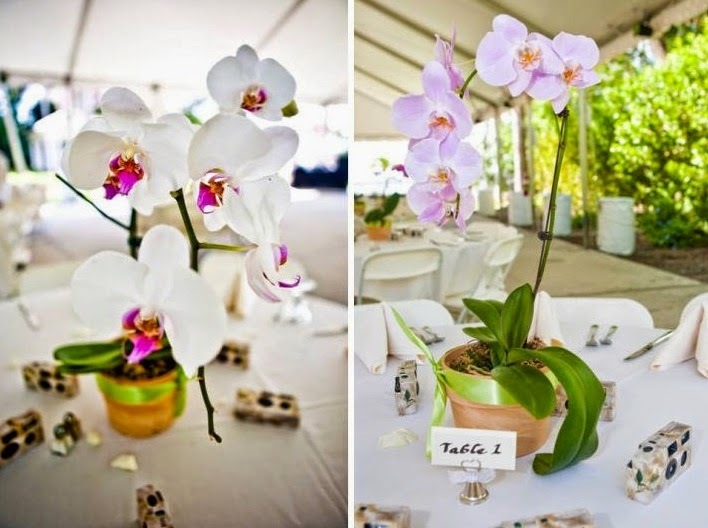 Orchids are long lasting, so you don't have to worry about the flowers wilting before the wedding. Their naturally arching form doesn't require any talent for floral arranging. Keep the orchids in a dark cool, but not cold room, in a bucket of water. Change the water daily. the day of the wedding, cut an inch off the bottom of the stems. Transport them to the wedding in the buckets. 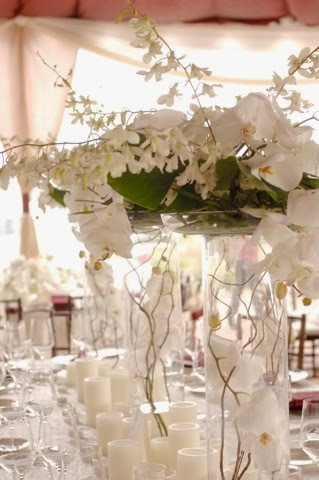 Put the vases on the table, fill with about 3 inches of water and put the orchids in the vases. Purple is the color you think of when you think of orchids. But orchids come in yellow, white, deep purple, and even red. Although red is more difficult to find. The size of the orchid flowers vary from tiny little butterfly blossoms to huge cattlya orchids. The bigger the flower the less of them you'll need. If you're looking for green flowers, you can count on orchids. 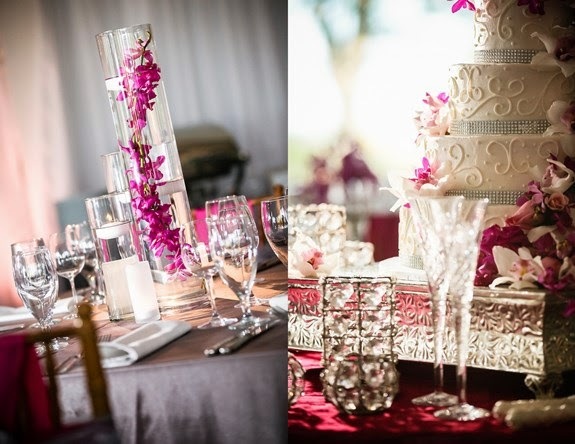 Remove some of the smaller orchids from the stems and scatter them on the cake table. Float the single flowers in wine glasses and then put votive candles on the table around the wine glasses. Just make sure that the flames aren't near the glasses. Otherwise the bottom of the glasses will get smoke stained. And of course you don't want to heat the water and have the orchids wilt. Gather up tall clear vases. Cut the stems of the orchid so they're shorter than the vase. Put a few inches of water in the vase and place a single stem of orchids in each vase. 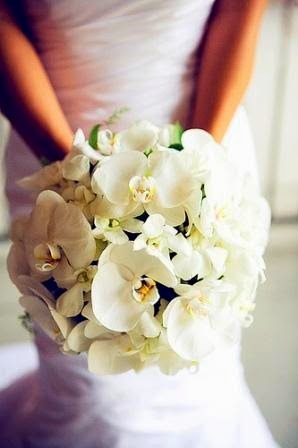 Orchids make wonderful wedding bouquets. Just tie a five or six stems together with ribbons and you're done. 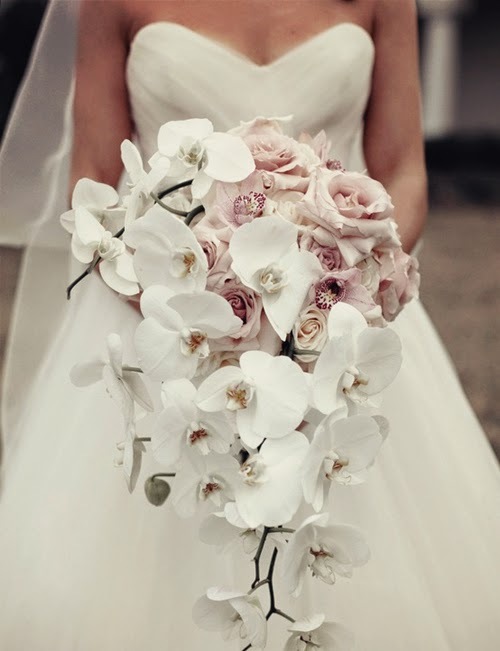 The bride could carry white orchids, the maid of honor, dark purple orchids and the bridesmaids a mixture of white, pale purple and dark purple orchids.